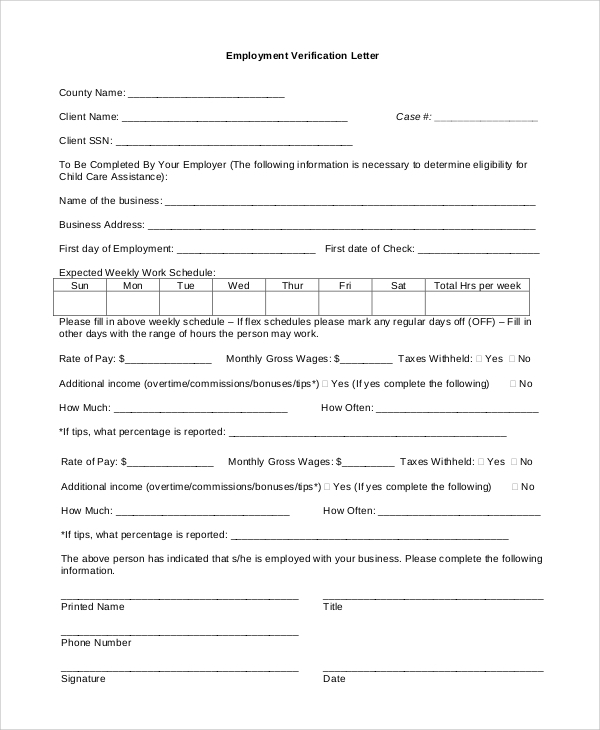 An employment verification letter is a very informative tool for the Human Resources department of any organization as it helps in processing the income verification forms. An employment verification letter is a medium of formal correspondence to the employees and provides all the details of the employment. Additionally, it also mentions the date of joining and the end date of the employment, if the job is a contractual one. 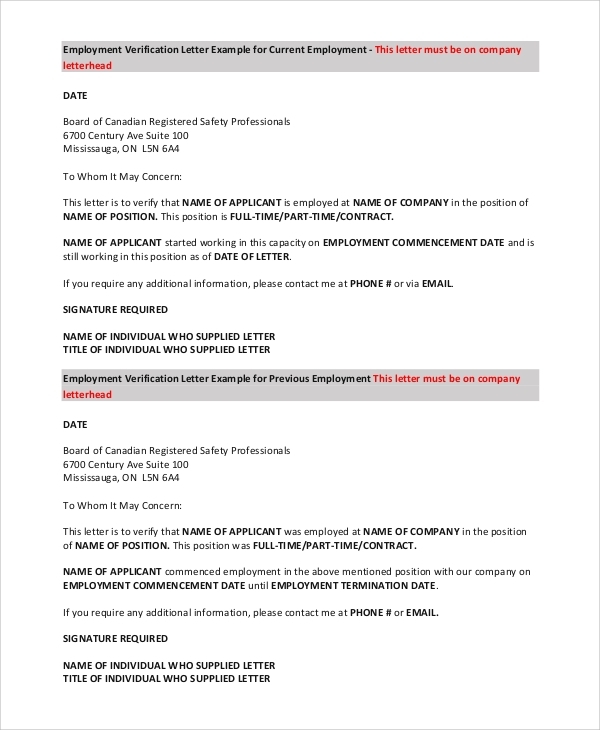 The primary purpose of this letter is the verification of the employee and confirming the employment contract. Sample Letters for the employment verification are available in plenty on the web for reference. 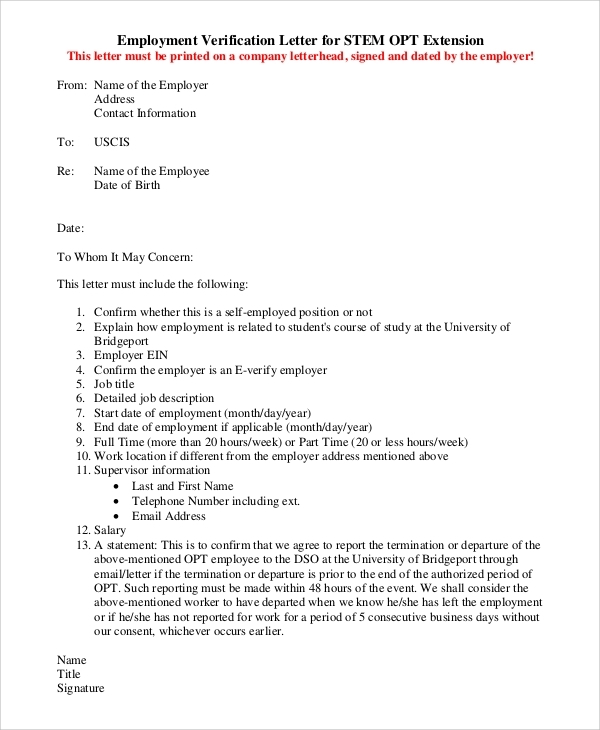 On campus letter of employment verification is obviously for the students who are in the last year of their graduation and have secured the opportunity of campus placement. Usually, the name of their college or university is also mentioned in this letter. This letter should be compulsorily written on the letterhead of the respective company, or it will not be considered for the processing of the income verification forms. This letter contains a detailed set of information about the employment terms and the salary. 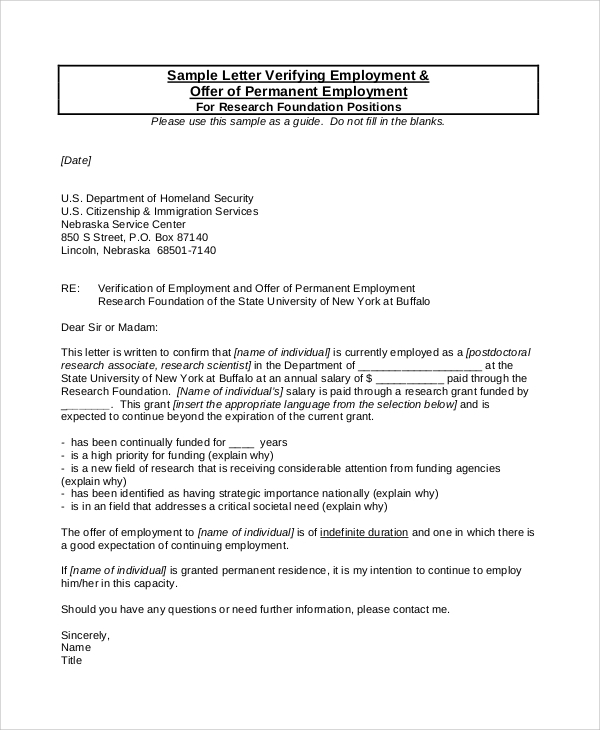 You can also see the Letter of Employment Samples. This letter is to be given to the employees who are employed on a permanent basis and hence the duration of the employment is not covered due to irrelevance. The details regarding salary and incentives must be mentioned for the purpose of income verification forms. What are the benefits of the Letter of Employment Verification Samples? 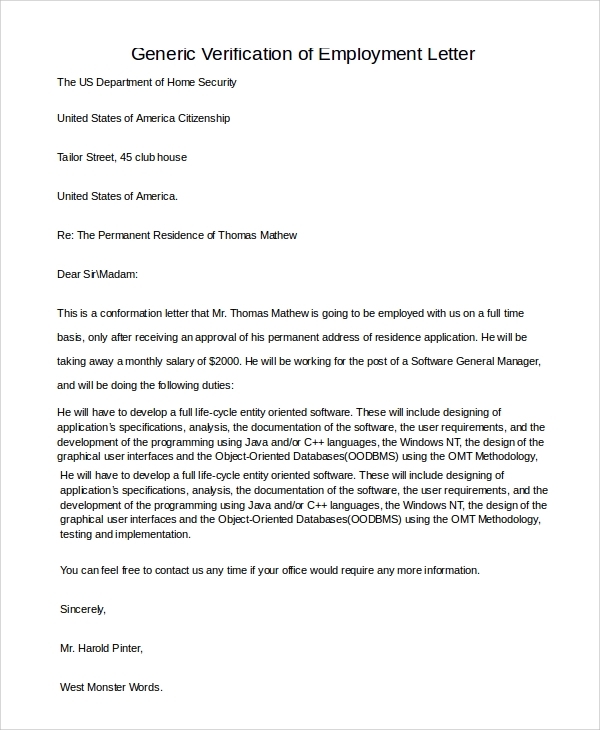 A Sample Employment Verification Letters is a multipurpose document, which is used for various purposes such as acquiring a green card, residential accommodation in a foreign country, for visa purposes and so on. 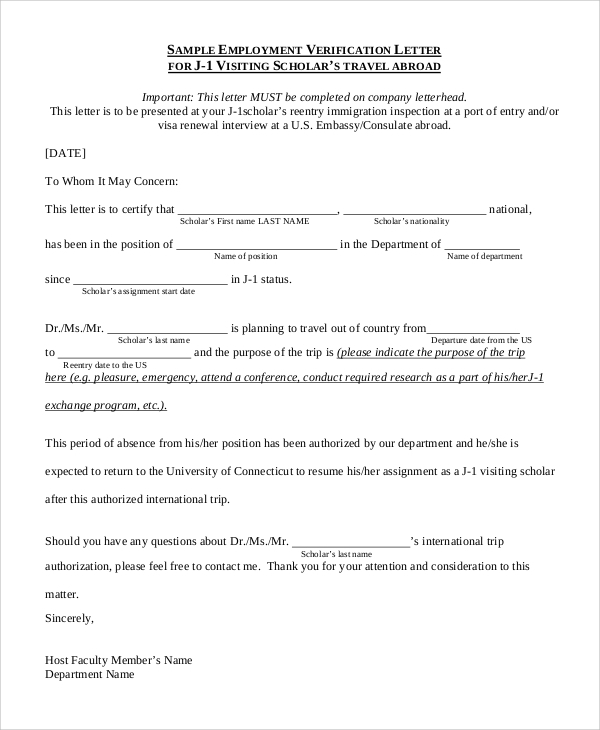 Another major benefit of this letter is that it is useful for the inter-departmental work of the organization and also provides all the relevant information for the income verification forms. 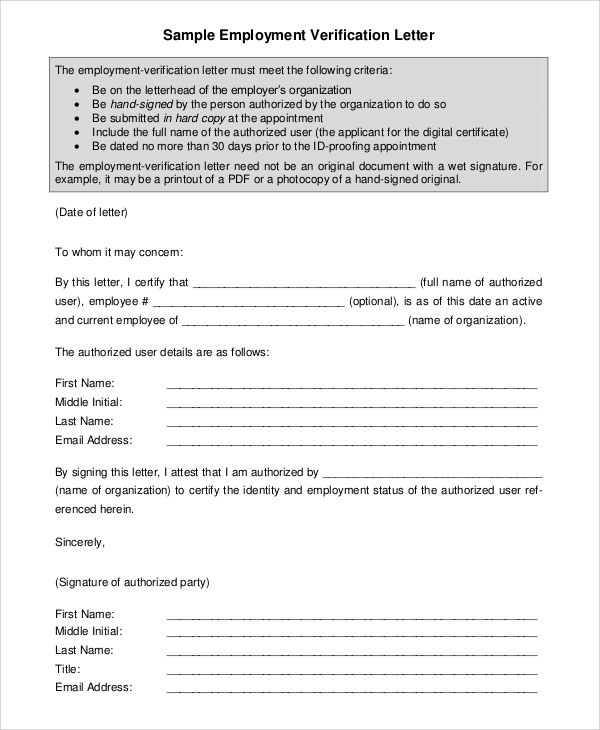 The letter of employment verification also serves as a document of proof in court appeals as this letter contains all the terms and conditions of the employment. It is also used as a crucial document for the curriculum vitae, and it can be used to justify the work experience column provided in your CV. In the case of international employment, the employment letter verification for a visa is the main tool to acquire a work visa in the respective country. 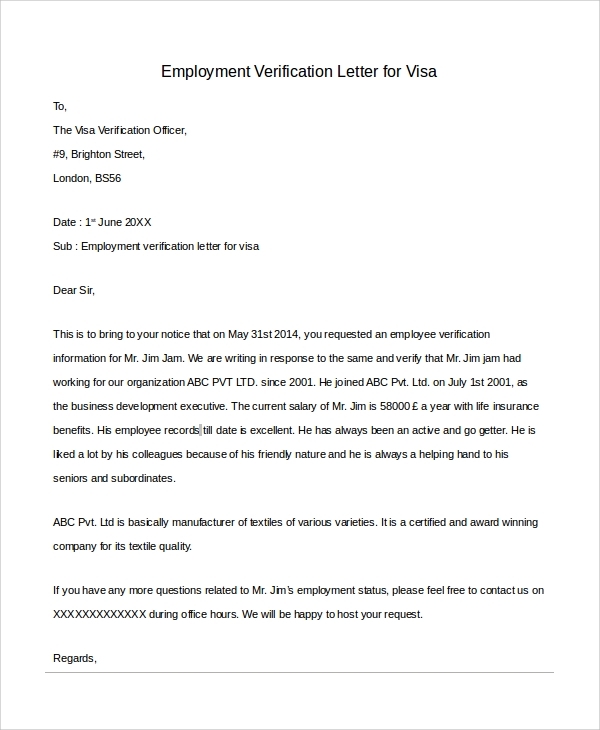 The letter must be addressed to the visa officer, and this confirms the employment of the respective employee. A formal letter of employment is required for various purposes. This letter can be used as a proof while acquiring a green card abroad or even if you are planning on getting a residential accommodation. Who is the Target Audience for the Letter of Employment Verification? The Verification of Employment Letter Samples is useful not only for the employers but also for the employees, which makes them the primary target audience of these letters. This verification letter is again mandatorily used by the Human Resources department of any organization as all the formalities regarding the employees are taken care by the same department. This letter is also useful for students who are working on campus and are in the last year of their graduation. This letter will be a proof of work experience for them which will enable them to get good jobs in the future. Lastly, it comes to great use while maintaining the payroll section of the employee. A letter of employment verification, given the importance, needs to be carefully drafted. 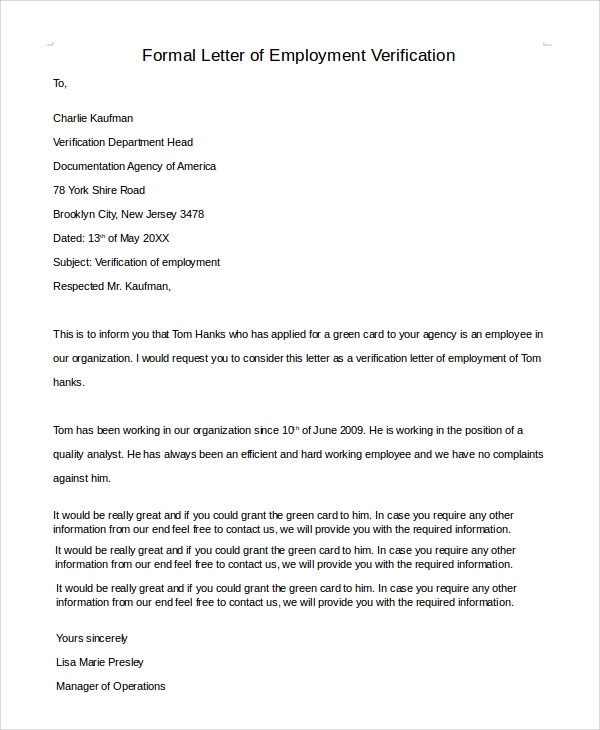 Sample Employment Offer Letters which are similar in nature can be used to draft these letters. This letter should be written on the official letterhead only, or it is less likely to be considered for payment terms and also will be of no use for income verification purpose. This letter indeed serves as an asset for both the employer and employee, hence the importance.